Save keystrokes: When you search for files using a file: / dir: / ext: / age: filter with no other search terms and there’s only one match, it will be opened in the editor automatically. That’s 100% less wear and tear on your Down and Enter keys! Thanks, Chris. Bugfix for very large files: Source files larger than 4MB are now always completely indexed. Thanks, Kyle. 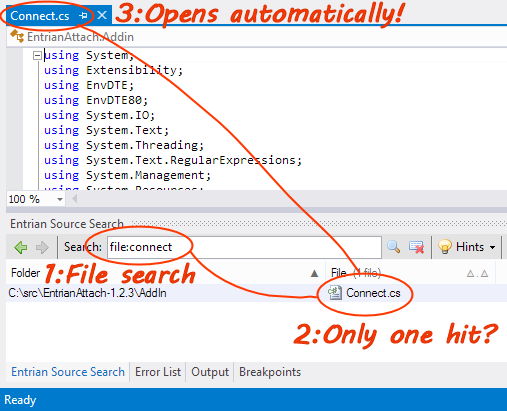 Bogus error removal: Sometimes the Visual Studio editor will raise a “Catastrophic failure” exception when showing a hit, even though the operation has worked perfectly. Rather than diligently passing these errors on, Source Search now ignores them. Thanks, Steve. As always, the release is available from the Source Search Download page as a free upgrade for licensed users and as a 30-individual-day trial for everyone else.